versatility around the garden, farm and ranch! Gardeners rejoice when they buy their first Muller’s Smart Cart™ and realize it won’t tip or rust and is lightweight, exceptionally balanced and rugged. Since 1975, gardeners around the world have been using Muller’s Carts™ for everything from their small weeding projects to planting trees, from composting to creating rock gardens. Muller’s garden carts™ can handle it all with ease. Why buy a Muller’s Cart™ for your garden? One-Handed Glide: Muller’s garden carts™ are balanced to a fault, offering superior maneuverability with one-hand operation. No more worrying about the wheelbarrow falling over as you push it two-handed and back-stooped up a hill. Tip-Forward Design: Unlike wheelbarrows and other carting devices, Muller’s garden carts™ are designed to tip-forward and stand balanced for easy raking-in, dumping-out and quick cleaning. Large Capacity: Muller’s garden carts™ offer 7cu. ft and 12cu. ft tub options and can haul hundreds of pounds with ease because the weight is balanced over the wheels, not in the handle. 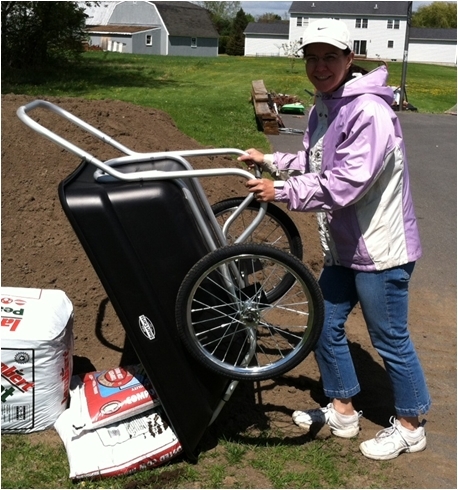 Longevity: Most wheelbarrows and carting devices either break or need repairs after 3 years of garden use. Muller’s garden carts™ are built to last decades without breaking. Lightweight: The aluminum frame and rugged plastic may last for decades, but they won’t break your back. Weighing less than 40 pounds and being supported by two weight-bearing wheels, Muller’s Carts™ are easy to use, no matter how old you are. Originally designed for stable use in 1975, Muller’s Carts™ are built to stand up to the heavy use and manure acids found in the barn. Chores are made easier and more efficient without the struggle of the everyday wheelbarrow. Our rugged tubs have no bolts or bolt-holes to crack and leak. The heavy-duty aluminum alloy is light-weight, won’t rust and is abrasion-resistant. This cart is built to last… for decades! 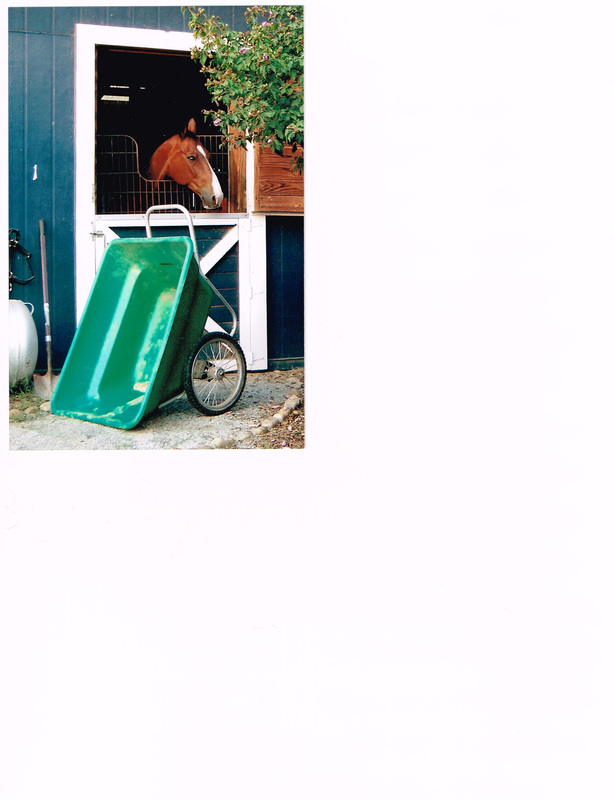 Why buy a Muller’s Cart™ for your stable?Simplicity: Balances and maneuvers beautifully with one-hand operation, even on rough ground or in stalls and tight spots...no struggling or risk of tipping over. Large capacity: We offer 7cuft and 12cuft options that help you haul heavy loads easier because the weight is balanced over the wheels, not in the handle. Why struggle with an awkward wheelbarrow? Tip-Forward Design Our Muller’s stable carts™ are designed to tip-forward and stand sturdy for easy in/out of material, quick cleaning and handy storage. Longevity and Value: Quite often wheelbarrows or lesser products break or need repairs after only a few months! Muller’s stable carts™ are built to last decades without breaking...no bolts to tighten or replace, no rust - nearly maintenance free. A Mullers Smart Cart™ will save you time and money! For Docks and Beaches, Wheelbarrows rust. Muller’s Carts™ don’t. Even in the harsh saltwater environments, Muller’s Carts™ aluminum frames and plastic tubs stay rust and leak free. Easy to use, long lasting and reliable, Muller’s Carts™ let you relax and enjoy your trips back and forth to the boat or at the beach without unnecessary worry. 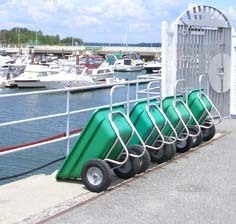 Why buy a Muller’s Cart™ for your marina? One-Handed Glide: Muller’s Carts™ are balanced to a fault, offering superior maneuverability with one-hand operation. No more worrying about the wheelbarrow falling over as you push it with two hands, down a steep dock. Tip-Forward Design: Unlike wheelbarrows and other carting devices, Muller’s Carts™ are designed to tip-forward and stand balanced for any and all of your hauling or moving needs. Large Capacity: Muller’s Carts™ offer 7cu. ft and 12cu. ft tub options and can haul hundreds of pounds with ease because the weight is balanced over the wheels, not in the handle. Longevity: Most wheelbarrows and carting devices either break or need repairs after 3 years of marina use. Muller’s Carts™ are built to last decades without breaking.